Google are bringing the Tour de France to life online with the launch of Google Street View in Europe. Google Street View can be used to see the Tour de France route and also includes the latest Google Street View technology including higher definition imagery coupled with face and numberplate blurring. 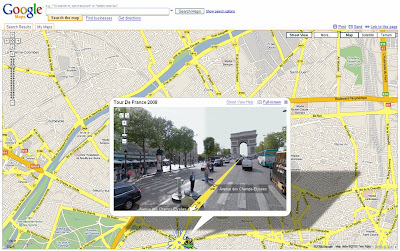 Users can then click at any point on the Tour de France route to see Street View detail with high definition Google Street View photographs taken at street level. The arrows on the yellow line in the Street View photo can also be used to move forwards or backwards and using the navigational arrow buttons to the left of the screen allows users to pan to see a full 360 panorama. There is a wide range of other online / social media around the Tour de France and http://www.tdfwiki.com/wiki/Main_Page seems to be a good reference point to find out which national broadcasters are covering the Tour de France on TV and online, as well as pointing users in the direction of blogs, Twitter accounts etc. Google Street View has had negative PR in recent weeks in advance of its European launch (eg http://news.bbc.co.uk) but privacy issues to one side, the technology and experience is impressive.